Nellie is a very unusual car. 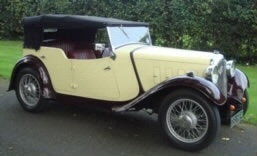 The Sports tourer model was made between 1933 and 1935 and very few were made, less than 10 now being known to survive. 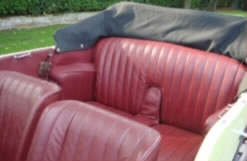 This car went out to Cyprus when new, returning in 1970. I bought it and restored it about 20 years ago, winning a number of awards with it. 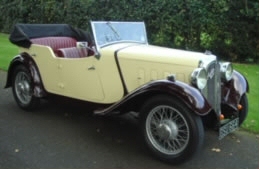 The car has a 1 3/4 litre 6 cylinder engine and real sports car sound and feel about it. It has four doors and ample room for large dresses. The hood is easy to put up and take down and so can be raised for travelling and lowered for arriving. There are side screens to give full protection should the weather demand it. 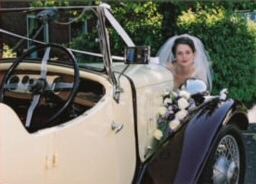 A very pretty and stylish car that will bring panache to your wedding day.